ARCO/Murray recently finished construction in Kokomo, Indiana for Vermilion Development on the first of five Silver Birch projects going up within a year. 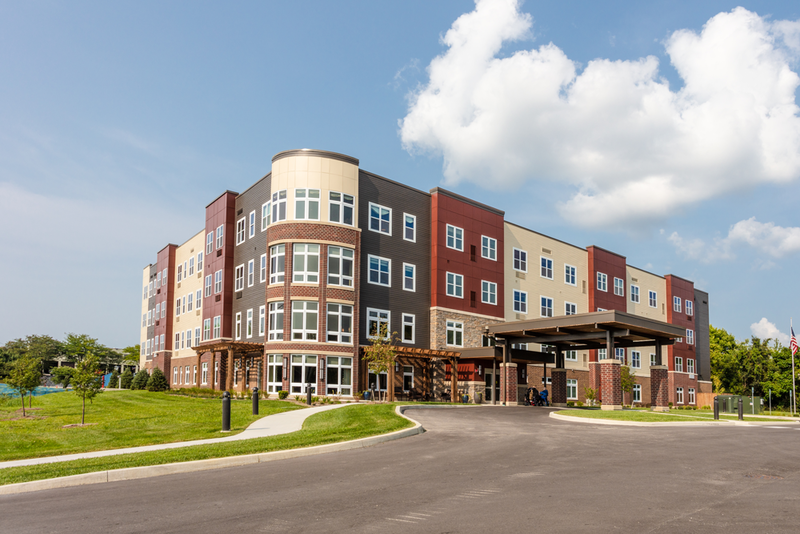 The 95,000 SF assisted senior living facility features 119 units and high-end amenities, such as onsite physical therapy, wireless nurse call systems, a bistro and a manicured courtyard with creekside views. Compared to similar facilities in the area, Silver Birch Kokomo features an increased ratio of amenity space which is notable given the affordability of its units. During construction of the four-story, wood-framed building, ARCO/Murray navigated city and IDEM requirements by sourcing clean fill from surrounding flood plains, solving the site’s brownfield location. Additionally, the design-build firm handled the acquiration of an NFPA 13R system, the installation of a new medium pressure gas (to support the building’s needs in a mostly residential area) and a redesign from one to two power systems during construction. The project took place simultaneously with a city-sponsored creek enhancement project located on the job site. Cost-savings were achieved through a series of value-engineered solutions including the implementation of aggregate piers to mitigate soil issues and an update to the building’s thermal envelope through a ComCheck study revision. ARCO/Murray completed the facility a month early and under budget. ARCO/Murray is Vermilion’s construction partner for the additional four Silver Birch projects in process Indiana. Evansville is the next location to complete this fall.